The Ironman 150T treadmill is the cheapest model from the Ironman brand. It is also one of the models in Ironman’s recently released T series. 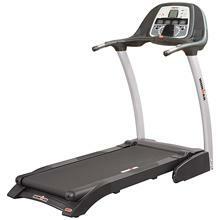 This is an entry level treadmill with features and specs comparable to some mid-priced units. Although this is another decent machine from Ironman, don’t expect too much from it. No matter what experts say, it is still an entry level treadmill. And you should only consider buying it if you really are on a tight budget. For a treadmill below $800, this unit has a huge motor. It comes with a 2.0 HP continuous duty motor that has a max speed of 10mph and a max incline of 12%. This is definitely hard to beat by any machines in the price range it is in. However, I think the 20'' x 56'' running space is a little too big for the motor. This unit may have a huge motor but it would still have a hard time running a tread belt this large. As a result, the motor might have to work doubly hard to move the belt which would lead to lots of problems in the future. A unique feature added to this machine (and others in the T series) is the new 2 speed cooling fan. It helps you stay cool and fresh especially during those long, grueling workouts. And finally, this unit has one of the best motor warranties in its price range, which is 10 years. Other warranties include a lifetime frame warranty, 1 year parts warranty, and 1 year labor warranty. The biggest weakness of this unit is its quality. The oversized tread belt is also something that would cause problems in the future. Although this model probably has the best features and specs for a machine below $800, I am still a little hesitant to recommend it due to its quality and oversized belt issues. But if you’ll take good care of it, the Ironman 150T treadmill is definitely worth your money. Also, if quality entry level treadmills are what you’re looking for, then is suggest you check out the Smooth 5.15P. It is our best buy treadmill below $1,000. Warranty: Lifetime on frames, 10 years for motor, 1 year for parts and labor. If you plan on buying an Ironman 150T Treadmill, I suggest you order online through Amazon.com. It is currently being sold for just $783.22. As an alternative, you can also visit your local Target or Costco outlets and negotiate for the best deal possible.